Paul Greenwood was born in Looe in 1947. His father was a shipwright by trade, later to become a cabinet maker and antique restorer, his mother a schoolteacher. The eldest of four children, he has two sisters, Penny and Louise, and a brother, Nick. He went to sea at the age of 16, joining the Iris in 1964. 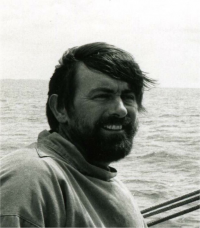 He later sailed as bosun aboard the Malcolm Miller before returning to fishing in 1973 and buying his own boat, the lugger Ibis, in 1978 which he used until 2002. He now lives in East Looe and owns the sailing lugger Erin. His first book, Once Aboard A Cornish Lugger, was published in 2007.